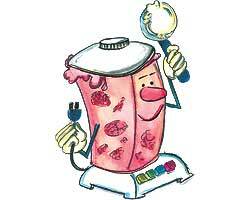 Place milk and powdered gelatin in a blender, cover, and mix well. Remove lid and add 1 cup ice cubes. Cover and blend in pulses until frosty. Add remaining ice cubes, pushing them to the bottom with a spoon. Cover and blend until smooth, stopping to scrape down the sides of the blender as needed. Add ice cream, pushing it to the bottom with a spoon. Cover and blend in pulses until mixed. Exchanges per serving: 1 skim milk. Carbohydrate choices: 1.